John Daniel Ehrlichman (March 20, 1925 – February 14, 1999) was an American civil servant and criminal. He worked as counsel and Assistant to the President for Domestic Affairs under President Richard Nixon. He was an important person in events leading to the Watergate scandal. He was convicted of conspiracy, obstruction of justice and perjury. He served a year and a half in prison for his crimes. 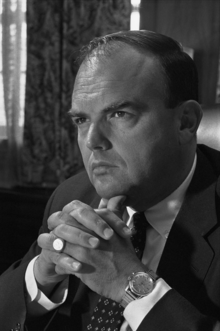 Ehrlichman died in Atlanta, Georgia from diabetes after refusing to receive any more dialysis treatments. He was 73 years old. This page was last changed on 7 November 2017, at 17:19.